This AR15 upper receiver assembly comes ready to attach to any Mil-Spec lower receiver. It is built around a 16 inch, 4150 chrome moly barrel that is chambered in 5.56 NATO and has a black nitride finish. The upper receiver is a forged M4 flat top upper, allowing you to easily attach rifle scopes and red dot sights to the picatinny rail. This is a blemished item and it may have a rough appearance due primarily but not limited to milling, dents, scratches, uneven finish, and missing or poorly applied stenciling. The term blemished applies to any defect to the appearance of the item or assembly and does not affect its function. 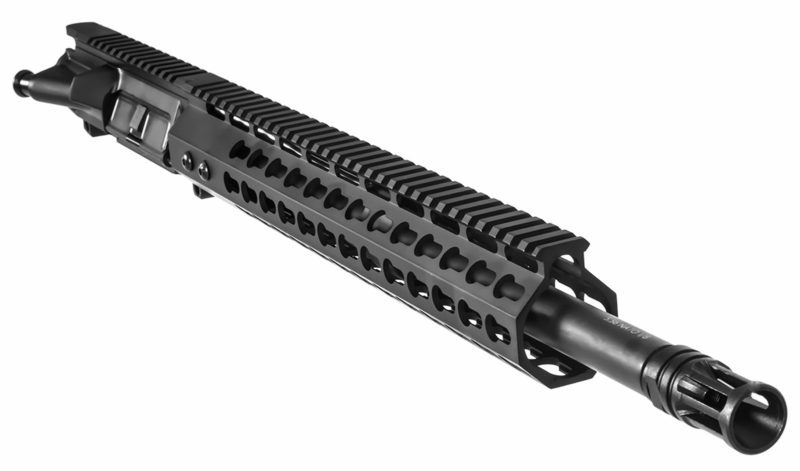 Outfitted with a 15″ Gen 2 Keymod Rail that features a seven-sided keymod design, resulting in 200% more attachable surface area of a standard keymod rail. The rail also features a full-length picatinny top rail that sits flush with the upper receiver and has anti-rotation tabs to keep it locked in place. This upper assembly comes with a standard A2 flash hider that effectively suppresses muzzle flash and protects the 1/2×28 barrel threads if you are planning on adding a muzzle break in the future. This upper was listed as a blem. The only blemish I can find is two very small scratches on the rail otherwise the fit and finish is excellent. I have only put 100 rounds thru it but so far I found it to be reliable and accurate. I don’t think you could do any better for the money. I would use CBC parts again without a second thought.